Many adults suffer from tooth loss and visit their dentists all the time for replacement, when there’s supposed to be only one stage in life when tooth loss should occur: as a little child. Normally you have 20 primary teeth at birth. These teeth, also called baby teeth, start to erupt at around six months of age. Permanent teeth normally replace these at different stages between the age of six and 12. The development of permanent teeth is what initiates the shedding of the baby teeth. The process exerts pressure on the roots of primary teeth, causing them to gradually become loose and fall out. There is often an interval between the shedding of baby teeth and the full development of permanent teeth. This explains why kids spend months with toothless smiles at some point. The 20 baby teeth mostly resemble the normal adult teeth in shape, arrangement, type and colour, even though there may be some mild-to-major natural colour changes as the child grows. All these must be lost at different points in the life of the youngster, beginning at six years of age. 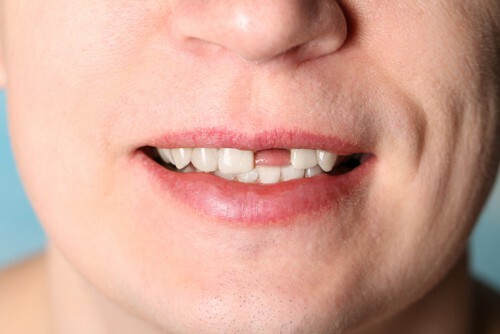 The two central incisors are usually the first to come off. They are shed at the age of six to seven years old. They are also the first to erupt, normally from the age of 8 to 12 months old for the upper jaw and six to 10 months for the lower jaw. The lateral incisor falls next – often between the age of seven and eight years. These erupt while a baby is aged between nine and 13 months old (upper teeth) and between the age of 10 and 16 months for the lower jaw. Shedding of the canines often follows at the age of 10 to 12 years old. Canine teeth on the upper jaw normally emerge when a baby is aged between 16 and 22 months. Those on the lower jaw erupt when the baby is at his or her 17th to 23rd month of age. There is the first molar that falls out between the ages of nine and 11 years. This set of baby teeth emerges at the age of 13 to 19 months (upper teeth) and 14 to 18 months of age for the lower jaw. The final baby teeth to be shed are the second molars. These are lost at the age of 10 to 12 years. They appear at the 23 – 33-month stage of infancy (upper teeth). The second molar on the lower jaw on the other hand erupts at the age of 23 to 31 months. Just before the appearance of the very first baby teeth; often the lower two central incisors; the toddler tends to become irritable as a result of the pressure of teeth pushing through their gums – a phase referred to as teething. Beginning from two to three months after the baby is born, their pink tender gums may become swollen and sore. This is what causes kids to be irritable during that period. While this is often a temporary episode that eventually passes, it is the time to start observing the right dental hygiene for your kid. Once your baby’s teeth start coming in, clean them with a soft brush twice daily. Do not use fluoride toothpaste until the baby hits two to three years depending on your dentist’s recommendation. Yes, you should start seeing a dentist for your baby as early as then. On average, children are required to start seeing a child dentist at around age three. Your dentist will often recommend that the baby gets some X-rays at age four to five years. The X-rays help discover any abnormalities that could be evident on the teeth and bones. The dentist’s attention is important; you get to make sure that your kid’s mouth is in good health and the teeth are forming properly. Any problems detected at this age will be addressed and the kid will be able to stay healthy. Your toddler’s baby teeth help guide the placement for his or her adult teeth. As such, any issues with the baby teeth would point to future problems with the permanent teeth and addressing them this early will open the way for healthy adult teeth for the young fellow. Molars first appear at age six, then again at age 12. There’s a third set of molars referred to as wisdom teeth. These are normally extracted either through a surgical procedure or the normal tooth extraction process. They are not needed since humans have evolved. Besides, wisdom teeth are often problematic because they show up when there’s hardly any room left for more teeth. They can be extracted anywhere from adolescent years through adulthood to avoid undesirable shifting of useful teeth. As a kid loses baby teeth to pave the way for permanent ones, there is a lot of coding of their DNA occurring as the body grows just before puberty. Soon the child begins to experience significant changes in size and appearance. This is where a lot of parents get it all wrong. They assume the kid will lose their teeth anyway so they advise the child against serious oral hygiene practices. By not practicing proper dental hygiene, the child can often experience build-up of bacteria leading to early cavities. The scary part is, such problems developed on baby teeth are often carried on to the adult teeth. has a lot to do with tooth loss at adulthood. The bacteria you accumulate earlier on may continue to affect your teeth causing painful cavities and prompting extraction. Age also accelerates these problems. As people become older, they begin to experience cavities as chewing wears down enamel causing it to become thinner and weaker over time. Other dental problems also become more common as people age. These include receding gums that naturally weakens the tooth leading to possible loss. Plaque build-up that is not regularly removed by a dental professional every year also tends to cause very serious tooth problems that end in tooth loss among adults. In essence, good dental care is required at all ages to keep tooth loss away. This includes regular dental check-ups. The dentist in Chatswood will monitor changes that happen in your mouth and find proper means to correct any problems as they come up so you can enjoy having healthy teeth for longer.